The unbridled pursuit of profit by powerful interests is actively delaying action on climate change. Climate denying corporate interests and their political counterparts, along with the press and cynical investments, are making progress on climate change mitigation very difficult. Republicans continue to oppose action on climate change. Rather than lead, Republicans in the House are catering to the most conservative elements of their own constituencies and putting partisan interests ahead of national interests. However, this is only part of the story. While it is true that American politics are polarized, this is a symptom of the problem not the cause. One of the reasons partisan fires are burning so bright is due in part to the influence of a powerful cabal of climate deniers. These interests, through their front groups and political minions in the GOP, have succeeded in hijacking the discussion by interjecting an element of doubt into the scientific consensus on climate change. The insane game of political chicken over the government shutdown and debt ceiling illustrates the dynamics behind the politics of impasse. Although Republicans in the House were finally forced to put an end to the hostage drama and pass an eleventh hour deal that reopens government in the short term and temporarily increases the debt ceiling, many are asking how we got into this situation in the first place and what is the likelihood of it recurring in early in 2014. Republicans claim they are concerned with reigning in federal government spending and opposing Obamacare. However, the cost of another credit downgrade from a debt default would have significantly increased the costs associated with servicing U.S. debt. The 16-day delay that once again brought the nation to the brink, rattled markets and cost at least 24 billion dollars. As far as Obamacare is concerned, America has voted twice and the Affordable Care Act legislation was upheld by the supreme court. Polls showing that Republicans are bearing the brunt of criticism over the shutdown and debt ceiling obstructionism suggest that something more pernicious than politics is at play. Why else would they be so eager to tarnish their brand? Tea party Republicans in the House are at the heart of this effort to undermine the federal government. They may genuinely believe they are engaged in an ideological war against “big government spending” and “socialism.” Although they may be oblivious to the ways they are being used by their climate denying puppet masters, they are serving the agenda of a powerful collection of old energy interests and those who stand to profit from a world ravaged by climate change. The collection of oil and other powerful corporate concerns have a vested interest in undermining government. We call them climate deniers, but those who are pulling the Republican’s strings know full well that the science behind climate change is sound. However, they also know that there are massive profit opportunities to be gained by making it difficult for President Obama and the democrats to deliver on their climate change mitigation promises. They know that significantly reducing the burning of fossil fuels is the cornerstone of efforts to reduce the impacts of climate change. The longer they can continue to foster doubt and stoke demand for petrochemicals, the longer they can continue to reap astronomical profits. How can American voters be so woefully misinformed that they can countenance Republican denial? The mainstream press plays an important role buoying the lies of deniers. As Sarah van Gelder reviews in an article, which is also the forward to her book Project Censored 2014: Fearless Speech in Fateful Times, corporate interests have managed to push coverage of climate change science off of most media outlets. When it is covered, it is commonly followed-up with the views of anti-science climate deniers in a misguided attempt to be “objective.” The reason for this is that most media channels are owned by big corporations that rely on billions of dollars from corporate advertising. To illustrate the point, earlier this year The Wall Street Journal published a ridiculous article titled “In Defense of Carbon Dioxide,” in which rising levels of CO2 were heralded as a boon to plant life. 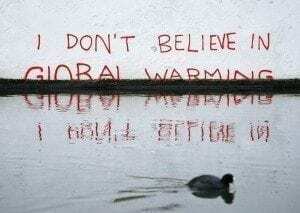 As van Gelder points out, although 97 percent of peer-reviewed scientific studies confirm the existence of anthropogenic global warming, only 42 percent of Americans believe the planet is warming because of human activity. Mainstream media is largely to blame for this collective state of delusion. Journalists have been afraid to draw the connection between extreme weather events and climate change, even though there is a convincing body of scientific evidence that clearly points to a relationship. The fourth estate will not even report the fact that if we continue with business as usual, scientists predict the world will warm by 6 degrees Celsius by the end of the century. Nor will they report that this will have cataclysmic impacts on human life including coastal flooding, food and water scarcity. She singles out the fossil fuel industry and other large corporations which have successfully undermined efforts to build a consensus on efforts to mitigate climate change. She cites the Supreme Court as “friendly to the power of big corporations.” She goes on to refer to a January 2013 Media Matters report, which shows how Republican climate change deniers are given overwhelmingly disproportionate coverage in the press. The fossil fuel industry and other powerful corporations do not want us to consider solutions like renewable energy to displace carbon-based fuels. They do not want to see green buildings, organic fertilizers, and highly efficient transportation. They certainly do not want to see carbon taxes, (which would be an effective way of putting the market to work to lower carbon emissions). Nor do they want to see President Obama succeed in implementing his climate change mitigation policy, or repeal fossil fuel subsidies. Certain corporate interests benefit from the fact that people who are informed about climate change have cause for despair. They welcome hopelessness which will give people cause to give-up under the weight of their awareness. They do not want to acknowledge the important work of responsible businesses that show that you can be an environmentally responsible corporate citizen while turning a profit. A far more cynical effort is unfolding that is creating financial incentives for inaction on climate change. Rather than put market forces to work to combat global warming, investors are now lining up to invest in companies that will profit from climate change. We are increasingly seeing investments that have a vested interest in a hot planet. These types of investments will actually increase in value if we are unsuccessful in our efforts to stave off the worst impacts of climate change. Pro global warming strategies include investments in things like water-treatment and farmland. A growing area of investment involves derivatives that help companies hedge against climate change induced extreme weather. Some of the world’s biggest investors are getting onboard. To illustrate the point, the Bloomberg article cites KKR & Co’s 2013 purchase of a 25 percent stake in Nephila Capital Ltd., an $8 billion Bermuda hedge fund that trades in weather derivatives. Drought is one form of extreme weather that is helping to drive a pro global warming investment strategy at Water Asset Management LLC. The New York hedge fund has about $400 million under management. This fund buys water rights and makes private equity and stock-market investments in water- treatment companies. As explained by Michael Richardson, head of business development at Land Commodities, “there is an overemphasis of its negative impacts [of global warming].” Not surprisingly, his firm stands to benefit from a warmer world, scarce arable land, and rising populations. Others are eagerly anticipating the melting of ice sheets in the Arctic either for northern sea navigation or access to oil and mineral deposits. One example is NunaMinerals, a mining startup based in Nuuk, Greenland. They are counting on global warming to melt the glaciers and expose mineral deposits including gold, rare earths, and base metal deposits. Mining operations in the Danish Arctic are huge as evidenced by the 524 million kroner ($91.5 million) invested in 2010. This represents a 75 percent increase from the previous year and the amount of capital invested is expected to increase as more land is exposed by retreating glaciers. There are a range of investments that are banking on climate change, but one of the most bizarre involves $30 million investment in mosquitoes by Oxitec Ltd., an Abingdon, U.K.-based startup. Mosquitoes are known to transmit disease like malaria and dengue fever and they will be a growing problem in a warmer world. To help minimize the mosquito population, Oxitec has developed a mosquito whose offspring are sterile, when mated with a wild female, their progeny do not survive to adulthood. Already the company is exporting a growing number of these mosquitoes to countries around the world. Others are investing in the “positive impacts” associated with global warming. For example, temperature increases of 3 degrees C. will result in higher crop yields in temperate latitudes, and a decreased requirement for space heating. There is a lot of money to be made in adaptation. Potential areas of investment include efforts to protect against flooding, combat malnutrition, address heat stress and manage extreme weather events. Arcadis, a Dutch engineering firm has been capitalizing on what it sees as a growing opportunity in flood management. They recently acquired ETEP Consultoria, Gerenciamento, e Servicos Ltda., a Brazilian water engineering and consulting firm. Due in part to superstorm Sandy, Arcadis’s revenue was up 26 percent last year, to 2.5 billion euros ($3.2 billion). Climate denying corporate interests undermine government, control the press and stand to profit from delaying action on climate. While others greedily welcome a warmer world in which derivative schemes or adaptation investments pay lucrative dividends. This agenda is at best a pyrrhic victory, as they will get rich by damning all of humanity to a climate change hell. Despite the depressing array of forces allied against a science based approach to combat climate change, we have reason to hope. Destructive corporate interests and their Republican puppets have reason to fear the millions of ordinary people who are at the forefront of efforts to expose the conspiracy of lies and push their political leaders to act on climate change.